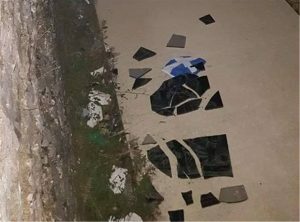 A group of Albanian nationalists vandalised a monument dedicated to the chieftain of the struggle for independence of northern Epirus, Thymios Lolis after they ‘raided’ the square of the village of Krania. One of the members pulled down a Greek flag hanging on a pole. 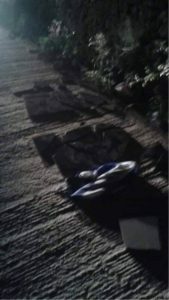 The young Albanian who removed the marble plaque and the Greek flag was spotted by Greeks and in his attempt to escape he threw down the torn flag and the plaque. He ran to the open fields where a group of other Albanians were waiting for him in a car. A police force arrived on the scene in the village of Agios Saranta. Albanian media has recently whipped up an anti-Hellenic sentiment similar to the one that had been cultivated in the incident of Vouliarates when Konstantinos Katsifas was killed by Albanian police. Recently, Albanian television broadcast a provocative anti-Hellenic documentary titled “When they honour the murderers of the Albanians”. The documentary focused on the fighters of Northern Epirus during World War II who fought for the rights of the Greek ethnic minority in Northern Epirus.